epub.us - I CONTAIN MULTITUDES I CONTAIN MULTITUDES - It's Over 9000! The Microbes Within Us and a Grander View of Life is a fascinating and intriguing journey into the world of popular science. It's got tons of useful and highly entertaining info on one of the most groundbreaking discoveries in biology. Life on planet Earth is splendid, and it's simply breath-taking if you look at it from a microbe's "point of view". Every animal in this world (the humans included) carries thousands, millions of microbes with it - bacteria, for example. Mr. Ed Yong, the author of this terrific book, has a great sense of humor, which allows him to keep us entertained and relaxed while talking about complex things that even the scientists don't fully understand yet. He dares us to look at ourselves and at the animals around us from a different angle. We usually see ourselves as individual human beings, but we're just a bunch of interdependent molecules. The microbes in our bodies are vital for our survival, as they are an important part of the immune system and fight against the diseases. Fish and other creatures in deep oceans fully depend on microbes to provide them with energy. A lot of people these days think that microbes are bad and disgusting, but the truth is - we won't be able to live a day without them. They're what we are made of: they form our bodies, give us the ability to walk, talk, eat and sleep. 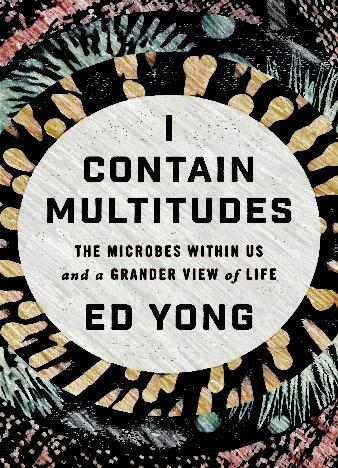 I Contain Multitudes is a wildly exciting tour into the universe of microbes, a brilliantly written, easy-to-understand description. Plus, Mr. Ed Young talks about the greatest scientists of our time whose work in the field can never be overrated. This book will change your perspective on the nature of things and educate you on where we, the humans, fit in this marvelous world.